Brandon Hicks was sent to the New York Mets yesterday for an undisclosed amount of cash. Hicks was designated for assignment by the A’s on Nov. 20th, the day teams had to finalize their 40-man rosters before next week’s Rule V draft. 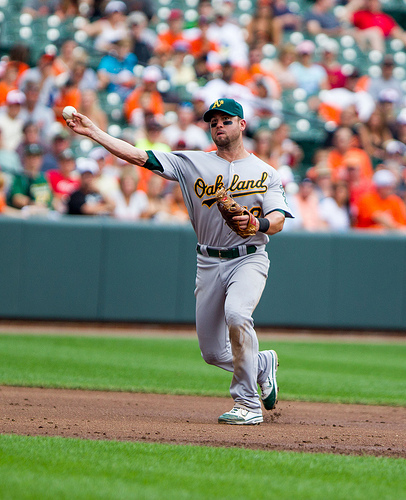 He played 22 games with the A’s this season, and batted .172 with three home runs and seven RBIs during two different stints with the A’s, who briefly used him as a platoon player at shortstop. Hicks was claimed off waivers by Oakland from Atlanta March 13 and spent most of the season at Triple-A Sacramento, where he hit .244 with 18 home runs and 61 RBIs in 90 games. Sounds like a good deal for the A’s as he probably wasn’t going to be part of their plans going forward. A quick post to let you all know that Bob Geren was “relieved of his duties” today. That doesn’t sound like “fired” to me so he may not in fact be gone from the organization. He is Billy Beane’s BFF after all. Anyway I wanted to share the good news with all of you. Yahoo!!!!! Almost any warm body would have been an improvement over Geren, but Melvin’s record is not the stuff of legends. His overall record as a manager is just under .500 (493 wins to 508 losses), but he has had 3 winning seasons since 2002: Seattle in 2003 and the Diamond Backs in 2007 and 2008. Let’s hope that he can turn the morale in the clubhouse around and the players can start playing up to their potential. Compared to Geren, however, Melvin looks good. Geren managed 711 games with the A’s from the 2003 season through yesterday. He compiled 334 wins and 376 losses for a winning percentage of .469. But Tony LaRussa who managed the A’s from 1986-1995 and had a .572 winning percentage, so there is lots of room for improvement for Melvin. 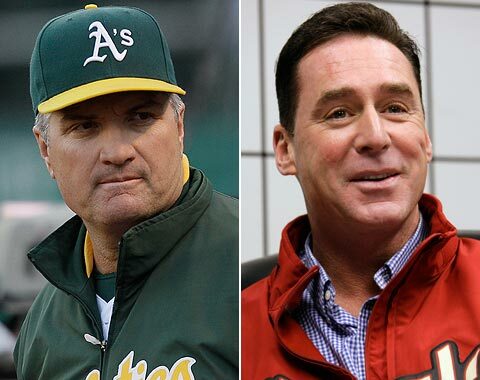 OAKLAND, Calif.—Oakland Athletics’ Vice President & General Manager Billy Beane announced today that Bob Geren has been relieved of his duties as manager and former Major League manager Bob Melvin has been named interim manager for the remainder of the 2011 season. Geren, 49, was named the A’s manager on Nov. 17, 2006. He registered a 334-376 (.470) record in four-plus seasons with Oakland, including a 27-36 mark and last-place standing in the American League West this year. 493-508 in seven previous seasons as a Major League manager from 2003-09 with the Seattle Mariners (156-168, 2003-04) and Diamondbacks (337-340, 2005-09). In addition, he held positions as Phil Garner’s bench coach for Milwaukee in 1999 and Detroit in 2000. Prior to those bench coach roles, he spent three seasons with Milwaukee in various capacities, serving as a scout in 1996, roving instructor in 1997 and as assistant to General Manager Sal Bando in 1998. Most recently, Melvin had rejoined the Diamondbacks as a special baseball advisor to President & CEO Derrick Hall last month, assisting the baseball operations department and other business divisions of the organization. Melvin graduated from Menlo-Atherton High School in Menlo Park, Calif. in 1979 and later attended and played baseball at the University of California in Berkeley. Detroit selected him as its first choice in the secondary phase of the 1981 January draft and the former catcher posted a .233 batting average with 35 home runs and 212 RBI while playing in 692 games during his 10-year Major League career with the Tigers (1985), San Francisco Giants (1986-88), Baltimore Orioles (1989-91), Kansas City Royals (1992), Boston Red Sox (1993), New York Yankees (1994) and Chicago White Sox (1994). Melvin becomes the 29th manager in franchise history and 18th in Oakland annals. I have been a fan of the Athletics since they moved from Philadelphia to Kansas City in 1955 when I was a child. I have a deep love for the game of baseball and the Athletics in particular. I am writing to you to urge you to use your influence to make some changes in the team and the Coliseum for the 2010 season and beyond. As a season ticket holder, I am concerned that the attendance at the Oakland Coliseum has been declining over the last three years (along with the teams record), but it dropped precipitously during the last half of the 2009 season, when the team was playing over .500 ball. I attended several mid-week night games when there were not more than 4-5000 people in the stands. The paid attendance was always 3-4000 more than that, which says to me that the other season ticket holders stayed away in droves. This is not good for A’s or your considerable investment in the team. I realize that low gate revenue hampers management’s efforts to make any significant moves that result in increasing the cost of running the team, but there are some things that can be done to improve the fan’s experiences which will result in increased attendance, better press coverage, increased TV advertizing revenues, and improved player morale. These things can be accomplished without large outlays of capital. Some may take some time, but others can be implemented in the 2010 season. By far the most important change that needs to be made is to fire (or transfer) Bob Geren from the job of Field Manager. It is obvious to any of us who study the game and the A’s that he does not have a clue how to manage a team or inspire the players to play at their top potential. Contrast Bob Geren, with his reserved demeanor and flat affect, to Tony La Russa, who kept his cool but could inspire mediocre players to achieve greatness. We need a manager who can do that. Bob Geren is definitely a liability to you and the team. You have the power to see that Bob Geren is no longer the manager of the A’s. I know that Bob and Billy Beane are best of friends, but you need to do what is best for the organization and the team, not what’s best for Beane and/or Geren. In any other franchise, three sub-.500 seasons in a row would have resulted in a management change. Please consider exerting your power as Managing Partner to make this happen. Hopefully you can get this done in 2010. If not, then please don’t exercise the club’s option for 2011. 1) In these bad economic times, have some more midweek nights with reduced prices on tickets and/or food items to encourage more people to come to a game. People look for bargains when times are tough. 2) Do away with the All-You-Can-Eat seats which are rarely occupied (especially for mid-week games), take the tarp off 2 more sections (5 sections total) in the third deck behind home plate, and charge the same price or a few dollars more than bleacher seats. That would get more people in the stands. Again it’s the economy. 3) If you don’t like No. 2) (or in addition), put outfield plaza-level and field-level seats on sale for half price starting 30 minutes before game time or at game time. You’d need a little more crowd control around the box office, but it could be done without costing much. People who want to see the whole game will still buy tickets at full price, and the additional people in the stands would buy lots more food, drink and souvenirs. 4) Put some color in the bathrooms to jazz them up. They are so bland and dingy now. For example, the River Cats’ restrooms have inspiring quotes from famous players or managers stenciled above the sinks. That doesn’t sound very important but it does improve the ambience in the stadium. Some quotes from baseball and football would make sense. The primary goal of anything you do must be to get more people to come to A’s games. Having a team on the field that is exciting to watch is the key. We have great young players and they will be much better in 2010 than they were in 2009 when they were getting their feet wet in the Majors. But to get the most out of them, we desperately need a new manager. How about Carney Lansford? He’s available, I hear. Or make Ty Waller Manager and Carney the bench coach. Thanks for considering the points I raised. As a long-time A’s fan, I only want what is best for the team, as I am sure you do too. Feel free to pirate any language from the above and write your own letter to Lew. Maybe we can get this done. Go A’s!!! I have written about this subject before: Bob Geren hasn’t a clue how to manager a team. Were you as deflated as I was when the A’s announced last week that the coaching staff for 2010 will be the same as in 2009? As I wrote in my last blog, the attendance for games other than the “Premium Games” (Giants, Red Sox, Yankees, etc.) has been dropping dramatically since July. Midweek night games drew somewhere around 7-8000 fans on average. That’s terrible. Billy Beane won’t get rid of Geren because they are BFF’s. So we have Bob at least until the end of the 2010 season. The team has an option for 2011, which I hope they don’t exercize. Here they are, 2 smiles and what almost looks like a sneer, at the presser when they announced Jason Giambi’s signing in January. Billy, how’d that work out for you, as Dr. Phil would ask? I don’t fault Giambi. Geren asked him to do something he wasn’t capable of doing: playing in the field almost everyday. Jason, being a good sport, did it, but he played in pain a lot and his hitting suffered. Look what he did at Colorado after BB+G let him go (and did it badly!) where he was used largely as a pinch hitter! So what can we do about Geren? As I have suggested before, we fans need to start a letter-writing campaign asking Lew Wolff to force Billy Beane to fire Bob Geren as manager, or at least not rehire him in 2011 . Maybe BB can give him a job in the front office, but let’s get him out of the dugout. Let’s flood his inbox with letters. Be respectful and don’t use profanity, threats or ad hominem attacks. Just tell him why you think Bob Geren has to go. Who knows? He might just listen to us if enough of us write. My letter will be in the mail tomorrow. Idea! Carney Lansford is available. Maybe we could get him! Make Ty Waller the manager and Carney the bench coach for 2010! Wouldn’t that be neat? Certainly a lot better than what we had this year. Oh well, it’s wishful thinking, I’m afraid. But I’m keeping my fingers crossed. Upcoming Topics: “Some Last Thoughts on the 2009 Season”, “Is it Dangerous to be a Fan?” and more. Check back periodically. I won’t be blogging as often as I do during the season. I have to concentrate on the final rewrite of my novel. I plan to start looking for an agent and/or publisher after the first of the year. Wish me luck.